That's right, finally a place to get T-shirts suitable for our unique jobs and our unique style. After all, we're only here for the T-shirt, right? We have department T-shirts, general T-shirts, and even shirts that aren't related to the job but that many backstage techs like anyway. You can request any of our T-shirts to come in camisole tank tops (women's) or sleeveless tees. What's that? Not used to spending money on T-shirts thanks to years of free band and crew shirts? Then send your family and friends here and have them buy it for you! If you have a T-shirt idea that you don't see here, submit your ideas and we will custom-make a shirt for you. You will recieve a price quote and a chance to view your Custom Design for no charge - pay only if you actually purchase the shirt! Most of our shirts are shown in our standard weight black T-Shirt. However, if you want any of our designs on a Tank Top, Hoodie, Babydoll, other style or different color, fill out the Request Form and we will send you a price quote. Standby to cue shopping ... and shopping go! We got a new name! Stagehand Tees has always catered to more than just stagehands. We've offered designs for most departments in most areas of entertainment production. Now our name reflects that! In addition to our new name, Backstage TeeShirts, we are also changing our URL. We will be keeping www.stagehandtees.com for a while and directing it to this website, but please update your links and bookmarks to www.BackstageTeeShirts.com to come here directly, because eventually we will be giving up the Stagehand Tees URL too. It sure has been a while, hasn't it! For starters, we are discontinuing our Submit A T-Shirt contest. Starting in August 2012, Stagehand Tees will no longer be accepting submissions to our Shop and awarding the winning design on a free t-shirt to the winner. We will, however, continue to accept Custom Design price quotes and orders, so keep sending in those requests and we will keep making those shirts for you! Instead, Backstage TeeShirts has a new offer! Starting August 2012, now you can submit photos of yourselves backstage or on the jobsite wearing your Backstage Teeshirt, and when we have collected several, we will put together an online photo album of all our Backstage TeeShirt customers wearing their shirts at work! 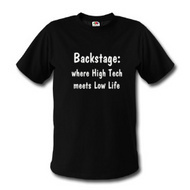 Email your photos to techie@backstageteeshirts.com. We are now on Facebook! Like us there and get updates to special coupons and deals! You can even shop right from our Facebook page! And finally, we have new shirt designs in most of our departments! So come inside and check them out! We added 3 new shirts this month! There are new shirts in the Rigging and Non Tech sections! Keep those submissions coming and you could see your Custom Design in our Shop next! We have two new t-shirts for this edition of our Newsletter - The Stagehand's Creed - requested by many stagehands all around the country, and Sun @ Zero Enter, submitted by Lowell Olcott of Cal Poly-San Luis Obispo. Congratulations! Lowell will receive a free T-shirt with his own Custom Design! This issue includes Nicole Borden as our Custom Design winner! She suggested an alternative to our popular Bi-Tech-Sual T-shirt for those not quite willing to make that statement. Now you can get any two departments on a shirt that says "I'm Ambi-tech-strous". Just Request one with your two favorite departments! We added a whole bunch of new shirts this month! There are new shirts in the Carpentry, General, Local, and Lighting sections! Douglas Shook of Henderson Texas won this issue's Custom Design contest with is DMX Nightlight Onesie for kids and in the Non-Tech Section, we even added high-top Converse-esque Poly Sneakers! Keep those submissions coming and you could see your Custom Design in our shop next! We took so long to get the next newsletter out, that we added a whole bunch of new shirts! Check them out in the Carpentry, Lighting, General, and Non-Tech sections! We even have a special T-Shirt Design Winner for that little lighting tech-in-training for those of you double-booking it as stagehands AND parents! Also, don't forget to check out our Resources section! We have lots of great links, including a newcomer to our Resources ... Behind The Scenes - an organization that provides financial assistance to stagehands, roadies and techies who are seriously ill or injured. Be sure to check them out! We have a new T-Shirt Design to add to our Shop! The Designer of the new shirt will receive his design on a Stagehand Tees shirt free and he was featured in our Newsletter, so keep those Custom Design suggestions coming! We also added a new Truck Loader T-Shirt! We have included an article in our Resources section just full of tips from Gig Etiquette to Tricks and Skills! Check it out! We will be maintaining this page and updating over time, so make sure you bookmark it! This month, in celebration of the holidays, we selected two T-Shirt Designs to add to our Shop. The Designers of the new shirts will receive their design on a Stagehand Tees shirt free and they were featured in our Newsletter, so keep those Custom Design suggestions coming! We also added a new Rigging T-Shirt! That's right, now you can have a say in what new T-shirts get added to our Shop! All you have to do is purchase anything from Stagehand Tees, and when you get your confirmation email, forward the email to us at Techie@stagehandtees.com with the subject header "Vote for T-Shirts" and the next time we add a new design to our Shop, you will be able to vote on which design you like best! You can even vote for your own design if it is among those selected. We've added more designs to our Shop, in the Non-Tech, General, Lighting, Local, Roadies and the all-new Wardrobe section! Check them out! That's right, we've updated our Shop to include 8 more designs! You've seen these designs in the shop but they were not available for purchase and now they are. So run around the Shop and see what's new! Be sure to visit our Resources section for all your industry needs all conveniently located in one place ... Stagehand Tees! We have a brand new addition to our Shop, courtesy of Doc Balcum! It says "Backstage: Where High Tech Meets Low Life". Doc Balcum, a union rigger with Local 9, Syracrus, NY will recieve his Custom Design T-Shirt free, courtesy of Stagehand Tees. Check it out in our General, Local and Roadies sections. Keep those suggestions coming, you might just see your Custom Design in our Shop soon!